Wednesday night I found myself outside getting the Big Green Egg ready for my Greek Stuffed Pork Tenderloin. This recipe is super easy and packed with flavor. I hope you enjoy putting it together. Take a half a cup of pitted Kalamata Olives and chop them up. Now take some spinach leaves and Chiffonade them until you get… a half a cup! Cook the pork loin for 30 minutes turning it every 10 minutes. Once the pork tenderloin measures 135° – 140° on instant read thermometer it is time to take it off and rest for 8 – 10 minutes. Slice in 1 1/2″ slices and serve. You will not be disappointed!!! Easy dish that is packed with flavor to cook on your Big Green Egg. Take a half a cup of roasted red peppers and cut them up too. Now take some spinach leaves and Chiffonade them until you get... a half a cup! Take ¾ of a pack of bacon and make your bacon weave. Mix the olives, roasted red peppers, and spinach with a small sleeve of goat cheese. Now mix all of that together until you get the cheese softened and the ingredients mixed through. Take a pork loin and butterfly it down the center. Pound that pork loin flat to ½ inch thickness. Spread the cheese and vegetable mixture across the butterflied pork loin. Place the pork loin with vegetable mixture on to the bacon weave. 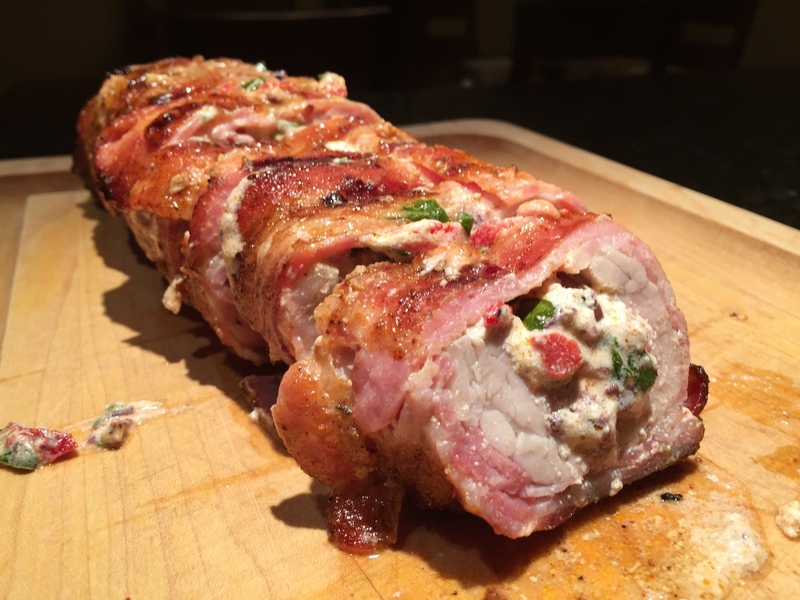 Roll the pork loin and bacon weave around the vegetable mixture. Sprinkle your favorite rub all over the wrapped pork loin and tie the pork loin with butcher's string. I used Meat Church Honey Hog Hot. Have the Big Green Egg set at 350° with a raised grid. Once your Egg is ready place the pork loin on the raised grid. Cook the pork loin for 30 minutes turning it every 10 minutes. Once the pork loin measures 135° - 140° on instant read thermometer it is time to take it off and rest for 8 - 10 minutes. Slice in 1½" slices and serve. You will not be disappointed!! !